Argentina coach Diego Maradona has delivered his 30-man provisional World Cup squad. Inter Milan duo Esteban Cambiasso and Javier Zanetti have both been overlooked as expected. Cambiasso has yet to earn a single cap under Maradona and Zanetti has missed the cut after some poor performances in Argentina’s qualifying campaign. Other notable exclusions are that of Real Madrid’s Fernando Gago, Valencia’s Ever Banega and Benfica’s Pablo Aimar. 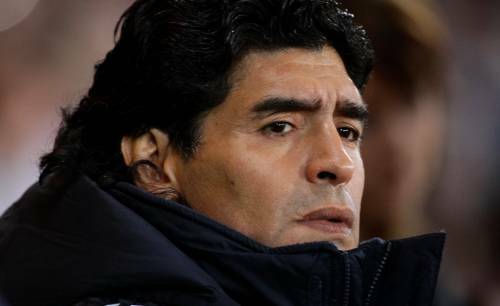 It seems Maradona has looked to the Argentinian leagues to stock the majority of his defense. However, as unproven as the backline may be, Argentina have a group of attacking options to die for – consisting of the likes of Lionel Messi, Gonzalo Higuian, Sergio Aguero and Carlos Tevez. Defenders: Martin Demichelis (Bayern Munich), Walter Samuel (Inter), Nicolas Burdisso (Roma), Gabriel Heinze (Marseille), Fabricio Coloccini (Newcastle), Ariel Garce (Colon), Nicolas Otamendi (Velez Sarsfield), Juan Manuel Insuarralde (Newell’s Old Boys), Clement Rodriguez (Estudiantes). Midfielders: Javier Mascherano, Maxi Rodriguez (Liverpool), Mario Bolatti (Fiorentina), Jonas Gutierrez (Newcastle), Juan Sebastian Veron, Jose Ernesto Sosa (Estudiantes), Angel Di Maria (Benfica), Javier Pastore (Palermo), Sebastian Blanco (Lanus), Jesus Datolo (Olympiakos), Juan Mercier (Argentinos Juniors). Forwards: Lionel Messi (Barcelona), Gonzalo Higuain (Real Madrid), Carlos Tevez (Man City), Martin Palermo (Boca Juniors), Sergio Aguero (Atletico Madrid), Diego Milito (Inter), Ezequiel Lavezzi (Napoli). Cambiasso will boss the midfield for Inter in the Champions League final. Much like he has for the whole season and he’s left out? Not very pragmatic. However if he is dressing room canker (which i don’t think he is) then it may be excused. Agree with Kipp – can’t believe Cambiasso isn’t in there. Zanetti’s vast experience will surely be missed too. why didn’t he pick Gabi Batistuta?? This is the winning squad I reckon. Maradona must be still on ‘crack’!!! how can you not have players like Cambiasso and Zanetti?!?!?!? if your going to pick players on form then them two should be the first players to be picked (Messi first of course). These players he is picking from the argentina league, no disrespect to them, but they are not playing against top oppositions and in the world cup you will be playing the ‘best of the best’. i want Argentina to win the world cup but this team selection will put so much pressure on Messi to perform. Maradona even said he wants everything to go through Messi. Messi is currently by far the best player in the world but even he can only withstand so much pressure/expectation that Maradona has just mutiplied by this ‘ridiclous’ team selection. For all his genius on the field, Maradona is a farce as a manager. Leaving out Cambiasso, who is enjoying a fine season for the likely European champions, in favor of domestic players and two Newcastle players just makes no sense. Let’s not forget that he also drove their most gifted playmaker (Riquelme) into international retirement. Argentina is unlikely to win with him at the helm, but if their enormous talent does win out, it will be in spite of Diego, not because of him. Of course, he’ll make sure to assume all the credit in this case. very liitle W/cup experience in this squad. How can Maradona leave out Cambiasso and Zannetti after a successful season at Inter? Argentina won’t go beyond the group stage! But of course there is plenty of space for 36 year old (and not very good in his prime) Martin Palermo as well as Jonas Gutierrez and Fabricio Collocini- both massive flops in the Premier League. argentina have been a mess, they’re lucky their group isn’t that hard or they could get knocked out, like in 02. It’s a Shocker !!! Also Riquelme & Pablo Aimar will be Missed ……. riquelme cambiasso zanetti not der. is maradona mad?